Ahmedabad: The satellite tagging of two whale sharks off the Gujarat coast by scientists of the Wildlife Trust of India (WTI) and the Gujarat forest department, some time ago, has allowed researchers a 350 -day and a 150-day peek into the lives of the world’s largest fish. The whale shark is among the least studied fish species. These satellite tags have busted the myth that whale sharks generally live near Australian shores and come to the Indian Ocean to breed. The two tagged whale sharks were found to be moving about in the Arabian Sea near Oman and Somalia, owing to the better food availability and conducive breeding conditions there. Interestingly, these initial findings of WTI officials corroborate the findings of the International Union for Conservation of Nature (IUCN). A 2016 IUCN report had stated that whale sharks found in the Atlantic and the Indian and Pacific oceans are not cousins but are ‘functionally separate’. The report acknowledged that whale sharks found along the Indian coast, including the coast of Gujarat, have no connection with those found in the Atlantic. The WTI, with permission from the forest department, is now planning to tag another three or four whale sharks to get more data. The WTI will soon move a proposal with the forest department, said sources. Sajan John, the WTI researcher who analysed the satellite data, said, “Data from these tags, which remained operational for 350 days and 150 days, revealed that these animals remained mainly in the Arabian Sea and did not move toward the east coast of India. Their movements were confined to the Arabian Sea and towards Oman and the Somali coast.” He added that a detailed study is being prepared and will be published soon. 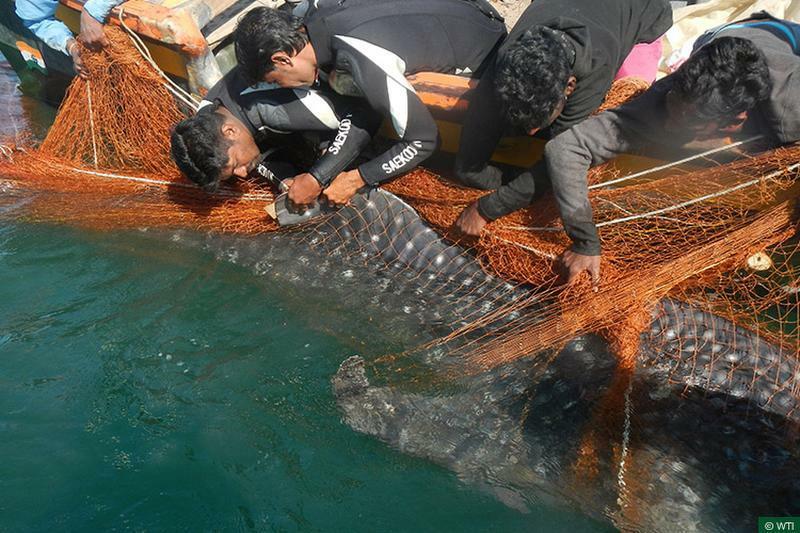 Forest department officials said whale sharks move between the Saurashtra coast and the Arabian peninsula due to relatively better availability of food. Whale sharks consume plankton — which includes copepods, krill and fish eggs — which is relatively abundant in the Arabian Sea. Officials said a comparative genetic study of whale sharks found off the Gujarat coast and off Australian coasts revealed that these populations are not related to each other in a manner to be considered as different parts of the same population. Forest department officials said the tag which lasted 350 days was on a female whale shark tagged off the Saurashtra coast in December 2016. Data from it showed that the animal had travelled all the way to the Somalia coast and returned to the India coast. The signal for the tag was then lost, with the latest location putting the animal just off the southernmost part of India. The tag that lasted 150 days, fitted last November, went all the way to the Oman coast before its signal was lost. Officials said an earlier WTI and forest department study, which had tagged six whale sharks in 2014, showed the animals travelling from off the Porbandar coast to near the Lakshadweep islands. The satellite tag signals get cut off when their battery runs out. Officials said the normal life of a tag is two years. These tags are imported and the research agency has to refrigerate them in storage. They also have to be switched on and off every 15 days in storage and this reduces their life. The effective life when the tag is applied is thus not certain.